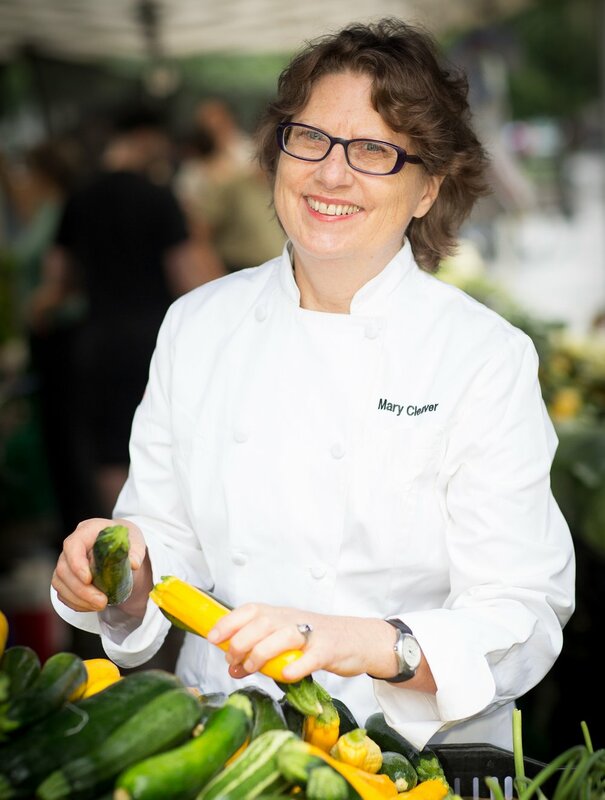 Today’s guest - in our own backyard here in NYC - is Mary Cleaver, founder of the Cleaver Co. and proprietor of the just recently reincarnated Green Table Restaurant in Chelsea Market and Table Green in Battery Park. Mary has been living and breathing Local Food since the 80s long before it was cool at a time when it was even scoffed at for being “dirty”. Her restaurant, the Green Table has thrived since 2003 and just this past summer has relocated to a different space (now known as Cleaver Counter) within the Chelsea Market. Many describe her company, which also provides catering and event services as one of the most - if not the most - rigorous of its kind as a B Corporation, i.e. a business that adheres to higher standards of social and environmental performance, transparency, and accountability. She’s one of the most influential people not just in the local food movement but in the entire food industry as someone who’s effects you’ve probably felt, even if you aren’t familiar with her name as she hasn’t pursued what many others do: a fancy Instagrammable space, a cooking show, or a loud, male chef. What should we be asking of our producers? How can we as individuals shop better? How do we cut through the noise of food marketing? How can we leverage our (under)used power as Consumers and what are the quickest wins we can achieve today? Bonus, we also talk about that time she took a weekend trip to New Orleans to get married. If there was ever someone today I would listen to when it comes to what it would take for us to eat in a way that’s good for us, our communities, our planet, AND our businesses…it’s Mary. Please enjoy this conversation with Mary Cleaver. 3:30 - Why is Local Food important? If Mary’s Life Story was Written in One Sentence: "Know where your Food comes from and make sure it contributes to Good Health"
Watershed - area of land that feeds all the water running under it and draining off of it into a body of water. Topsoil - upper, outermost layer of soil, usually the top 2 inches. It has the highest concentration of organic matter and microorganisms. Ruminate - of ruminants like cows, to chew repeatedly for an extended period. Greenwashing - form of spin in which marketing is deceptively used to promote the perception that an organization's products, aims or policies are environmentally friendly. Concentrated Animal Feeding Operation (CAFO) - a farm in which animals are raised in confinement—that has over 1000 "animal units" confined for over 45 days a year; a hallmark of Industrial Agriculture. Regenerative Agriculture - an approach to food and farming systems that rejects pesticides, artificial fertilizers and aims to regenerate topsoil, increase biodiversity, improve water cycles, enhance ecosystem services, increase resilience to climate fluctuation and strengthen the health and vitality of farming and ranching communities. http://bittman.blogs.nytimes.com/ (Archived) -- Former “Minimalist” columnist Mark Bittman focuses on the connections between food, the environment, and health in his latest project at The New York Times. http://civileats.com/ -- Promoting critical thought about sustainable agriculture and food systems. http://www.eatwellguide.org/ -- Search over 25,000 hand-picked restaurants, farms, markets and other sources of local, sustainable food. www.eatwild.com – Everything you need to know about ‘free range’ meat and poultry. www.farmtotable.org – Find out where to buy products from local farms and wineries. www.foodfirst.org – Great resource for learning about international agricultural policy, especially sub-Saharan Africa and Central and South America. http://foodmyths.org/ -- The real story about what we eat. http://www.foodpolitics.com/ -- Marion Nestle examines current issues relating to food policy and public health. www.meatrix.com – The Meatrix Relaunched, The Meatrix 2, the Meatrix 2 ½. Fun and informative spoofs that bring to light so many of the issues involved in the meat industry worldwide; a must for all ages! www.nofa.org – Northeast Organic Farming Association, includes links to state chapters. www.orionmagazine.org – A great source for environmental policy and philosophy. Click on Food & Agriculture link on left sidebar for some great pieces, especially Wendell Berry’s essays Renewing Husbandry and The Agrarian Stand. www.rocnetwork.org – Working toward a sustainable food system in one generation. You can join the Changemakers Network, a California-wide effort to transform California’s food system by 2030, supported by Roots of Change. www.smallplanetinstitute.org – Fosters democracy worldwide through the lens of food and hunger. Muhammad Yunus – the innovator of ‘micro-loans’ and a Nobel Laureate – works with them, as do a bevy of other activists. A deeply informative site, check out the books, blogs and articles. www.sustainabletable.org – Educates consumers on food-related issues, and works to build community through food. The glossary of terms under the ‘issues’ tab is excellent. http://thefern.org/ -- Food and Environment Reporting Network is an independent, non-profit news organization that produces in-depth and investigative reporting on food, agriculture, and environmental health. Ecological Medicine: Healing the Earth, Healing Ourselves – by Kenny Ausubel. An interesting selection of essays that vary from the thoughtful and intimate to the angry and urgent. Third Plate – by Dan Barber New York chef Dan Barber offers a radical new way of thinking about food that will heal the land and taste delicious, too. Bringing It to the Table: On Farming and Food – by Wendell Berry. A collection of essays by the infamous farmer/author/activist/poet in which he addresses such concerns as: How does organic measure up against locally grown? What are the differences between small and large farms, and how does that affect what you put on your dinner table? What can you do to support sustainable agriculture? How to Change the World – by David Bornstein. Bornstein tells the stories of people who have both changed their lives and found ways to change the world, people who have discovered how to use their talents and energy to advance deeply meaningful changes – the stories of defiant people who refuse to accept the status quo, who simply cannot sit still in the face of injustice, suffering or wastefulness. Social Entrepreneurship: What Everyone Needs to Know – by David Bornstein. In this more specific book, Bornstein describes what social entrepreneurs are, how their organizations function, and what challenges they face. Gives readers an understanding of what differentiates social entrepreneurship from standard business ventures and how it differs from traditional grant-based non-profit work. Lentil Underground – Liz Carlisle A protégé of Michael Pollan tells the remarkable story of an unheralded group of Montana farmers who have defied corporate agribusiness by launching a unique sustainable food movement. This Common Ground: Seasons on an Organic Farm – by Scott Chaskey. A sprightly account of “the education of a gardener become farmer, representing a committed community,” and “the challenges faced by all small farms, enlivened by a wind from the sea.” Chaskey offers a strong argument to the general public, that with careful management of the soil, everyone can gain access to land and good food. Sustaining Life – by Eric Chivian and Aaron Bernstein. A comprehensive – and sobering – view of how human medicines, biomedical research, the emergence and spread of infectious diseases, and the production of food, both on land and in the oceans, depend on biodiversity. Lunch Lessons – by Ann Cooper. A collection of practical, easy-to-follow solutions for the daily school lunch pail and tips on getting involved locally to transform school lunch programs. The Locavore Way: Discover and Enjoy the Pleasures of Locally Grown Food – by Amy Cotler. Discover how wonderful it tastes to be a locavore –no matter where you live or what your budget. Pig Tales: An Omnivore’s Quest for Sustainable Meat – Barry Estabrook An eye-opening investigation of the commercial pork industry and an inspiring alternative to the way pigs are raised and consumed in America. Eating Animals – by Jonathan Safran Foer A must-read for anyone interested in sustainability, the book is a deeply personal account that addresses the moral, health, cultural, economic, and political issues involved with eating animals. Foer concludes that even with a growing local and “ethical” meat industry, eating animals in today’s society can never be justified. Unlike many others who try to tackle the topic of vegetarianism, Foer does not write angrily or self-righteously. His argument is clear, fair, and effective. Harvest for Hope – by Jane Gooddall. Discusses a variety of ethical issues related to the sustainability of natural resources, the well-being of animals and our own health, and encourages us to consider the significance of our daily food choices. Our Choice – by Al Gore Whereas “An Inconvenient Truth” mainly discussed the problems posed by climate change, “Our Choice” focuses on the solutions that can help us overcome “the greatest threat humanity has ever faced.” The book is especially interesting in its latest incarnation: an iPad and iPhone app. The app includes all sorts of graphics, videos, high-resolution photos, and interactive content. It is informative and fun to explore. This Organic Life: Confessions of a Suburban Homesteader – by Joan Dye Gussow. Two decades ago, when nutritionist Gussow was giving fiery speeches about the importance of eating locally and seasonally, she realized that it was time to put her convictions into practice. In this combination memoir, polemic, and gardening manual, Gussow discusses the joys and challenges of growing organic produce in her own New York garden. Eat Here: Homegrown Pleasures in a Global Supermarket – by Brian Halweil. Some people may ask, “What’s wrong with getting my food from some distant land, if the food is cheap and the system works?” The point Halweil, a senior researcher at the Worldwatch Institute, makes throughout this book is that those prices are artificially low, and the system is actually broken. Halweil’s writing is journalistic in its reliance on interviews with farmers and activists, but the book’s abundant statistics, graphs and suggestions for action lend it the tone of a policy paper—one that is, nonetheless, impassioned and accessible. Blessed Unrest – by Paul Hawken. How the Largest Movement in the World came into being, and why No One Saw It Coming. Natural Capitalism: The Next Industrial Revolution – by Paul Hawken. An analysis of how capitalism would work if the world's “natural capital” were properly valued, resulting in a drastic reduction in resource use by industrialized countries. The Fatal Harvest Reader: The Tragedy of Industrial Agriculture – by Andrew Kimbrell. Kimbrell takes an unprecedented look at our current ecologically-destructive agricultural system and offers a compelling vision for an organic and more environmentally safe way of producing the food we eat. Diet for a Small Planet – by Frances Moore Lappé. With an updated introduction to her 1971 classic, Lappé stresses how her philosophy remains valid, and how food remains the central issue through which to understand world politics. Diet for a Hot Planet – by Anna Lappé. An extremely timely inspection of the effects of our food system on climate change and what we need to do to ensure that our diet is as healthy for the planet as it is for us. The Organic Foods Sourcebook – by Elaine Marie Lipson. One of the best books yet on the often confusing world of organics! Lipson has taken a complex, unwieldy subject and created an elegantly written, easy-to-understand and enjoyable to read guide. Short enough to be manageable, yet still comprehensive. Moveable Feasts: From Ancient Rome to the 21st Century, the Incredible Journeys of the Food We Eat – by Sarah Murray. Murray, a Financial Times contributor, takes a look at the literal journey of food through multilayered essays about the history of food transportation. From the banana export business of Central America (which was rife with America's economic gain and political manhandling) to the creation of the barrel (which revolutionized transcontinental trading and contributed a new dimension to the art of winemaking), the dozen chapters each start with a straightforward item – the shipping container, a tin can, a tub of yogurt – and then delve into topics of greater significance like globalization, empire building, localized farming and food aid programs. Food Safe: Bacteria, Biotechnology and Bioterrorism – by Marion Nestle When it comes to food safety, billions of dollars are at stake, and industry, government, and consumers collide over issues of values, economics, and political power – and not always in the public interest. Accessible, informed, and even-handed, this book is for anyone who cares how food is produced and wants to know more about the real issues underlying today's headlines. Defending Beef – Nicolette Hahn Niman The manifesto of an environmental lawyer and vegetarian turned cattle rancher, who builds the comprehensive argument that cattle can help build carbon-sequestering soils to mitigate climate change, enhance biodiversity, prevent desertification, and provide invaluable nutrition. Slow Food: Collected Thoughts on Taste, Tradition, and the Honest Pleasures of Food and Slow Food Revolution: A New Culture for Eating and Living – by Carlo Petrini. The first of these is an anthology, the latter a conversation/interview format book with the founder of Slow Food. Both are great primers on both the slow food ‘movement’ and its obstacles and rewards. Cooked – by Michael Pollan In Pollan’s exploration of the four classical elements – fire, water, air, and earth – that transform our food, he argues that taking back control of cooking may be the single most important step anyone can take to help make the American food system healthier and more sustainable. In Defense of Food: An Eater’s Manifesto – by Michael Pollan. His new book takes up where the previous work left off. Examining the question of what to eat from the perspective of health, this powerfully argued, thoroughly researched and elegant manifesto cuts straight to the chase with a maxim that is deceptively simple: Eat food, not too much, mostly plants. The Omnivore’s Dilemma – by Michael Pollan. This is a book about how our food is grown – what it is, in fact, that we are eating. Really it is three books in one: The first section discusses industrial farming; the second, organic food, both as big business and on a relatively small farm; and the third, what it is like to hunt and gather food for oneself. Food, Inc: Mendel to Monsanto – The Promises and Perils of the Biotech Harvest – by Peter Pringle. Imagine a world where yellow beans are patented, aromatic basmati rice has lost its fragrance because of genetic tinkering and Canadian farmers are sued by multinational behemoths because pollen from genetically modified crops somehow got into their fields and fertilized their plants. You don't have to imagine it: this, says Pringle, is the world we live in today. A widely-published journalist, Pringle paints a troubling picture of the world's food supply. Raising Less Corn, More Hell – by George Pyle. An opinionated, rousing tale of how ConAgra forced out small farmers and radically compromised the health of our soil, water, economy and food supply over the last half century. Diet for a New America – by John Robbins. In this expose of America's “factory farms,” Robbins, who is medical director of the California Institute for Health and Healing, details how livestock is raised under increasingly industrialized conditions by “agribusiness oligopolies.” The author correlates our “protein obsessed” society with a higher incidence of arteriosclerosis, osteoporosis, cancer and other degenerative diseases, as well as freakish occurrences like premature puberty from estrogen contamination. Stolen Harvest – by Vandana Shiva. Charts the impacts of industrial agriculture and what they mean for small farmers, the environment, and the quality and healthfulness of the foods we eat. Stolen Harvest is a short, impassioned, and inspiring book that will shape the debate about genetic engineering and commercial agriculture for years to come. Fast Food Nation – by Eric Schlosser. The wildly popular polemic on fast food culture and production is at its best when talking about the cruelty and the environmental, health and socio-economic ravages of the meat industry. A quick and informative read. The Way We Eat and Why Our Food Choices Matter – by Peter Singer and Jim Mason. Short on bluster, long on factoids. Did you know that NYC currently has 47 greenmarkets that sell 120 varieties of apple and 350 kinds of peppers? Learn why during the latest scare over spinach, organic purveyors were unaffected. Find out exactly why wild salmon is better than farmed. A great book for little morsels of info – just the kind of fact-dropping you need for cocktail parties. Plenty: One Man, One Woman, and a Raucous Year of Eating Locally ­– by Alisa Smith and J.B. Mackinnon. Over a meal of fish, potatoes, and wild mushrooms foraged outside their cabin in British Columbia, the authors of this charmingly eccentric memoir decide to embark on a year of eating food grown within 100 miles of their Vancouver apartment. Thus begins an exploration of the food ways of the Pacific northwest, along which the authors, both professional writers, learn to can their own vegetables, grow their own herbs, search out local wheat silos and brew jars of blueberry jam. Waste – by Tristram Stuart. With shortages, volatile prices, environmental disasters and nearly one billion people hungry, the world has a food problem – or thinks it does. Combining front-line investigation with startling new data, Waste shows how the way we live now has created a global food crisis - and what we can do to fix it. Rediscovering Values: On Wall Street, Main Street, and Your Street – by Jim Wallis. The Conscious Kitchen – by Alexandra Zissu. A guide to buying and cooking food, while protecting the earth, improving your health and eating deliciously. An Inconvenient Truth – Director Davis Guggenheim eloquently weaves the science of global warming with Mr. Gore's personal history and lifelong commitment to reversing the effects of global climate change. A longtime advocate for the environment, Gore compellingly presents a wide array of facts and information. Big River – Big River follows the return of those two friends to Iowa on a mission to investigate the environmental impact their corn has sent to the people and places downstream. Food Chains – This expose chronicles the revolution taking place in America’s fields: an intrepid group of Florida farmworkers battle to defeat the $4 trillion global supermarket industry through their ingenious Fair Food program, which partners with growers and retailers to improve working conditions for farm laborers in the United States. Food, Inc. – This film lifts the veil on our nation's food industry, exposing how our food supply is now controlled by a handful of corporations that often put profit ahead of consumer health, the livelihood of the American farmer, the safety of workers and our own environment. Food, Inc. reveals surprising and often shocking truths about what we eat, how it is produced and who we have become as a nation. King Corn – A documentary about two friends, one acre of corn, and the subsidized crop that drives our fast-food nation. Our Daily Bread – Welcome to the world of industrial food production and high-tech farming! To the rhythm of conveyor belts and immense machines, this German film looks without commenting into the places where food is produced in Europe: monumental spaces, surreal landscapes and bizarre sounds – a cool, industrial environment which leaves little space for individualism. Super Size Me – Why are Americans so fat? Two words: fast food. What would happen if you ate nothing but fast food for an entire month? Filmmaker Morgan Spurlock does just that and embarks on the most perilous journey of his life. The Future of Food – This film offers an in-depth investigation into the disturbing truth behind the unlabeled, patented, genetically engineered foods that have quietly filled U.S. grocery store shelves for the past decade. The Real Dirt on Farmer John – The epic tale of a maverick Midwestern farmer. Castigated as a pariah in his community, Farmer John bravely transforms his farm amidst a failing economy, vicious rumors, and arson. He succeeds in creating a bastion of free expression and a revolutionary form of agriculture in rural America. What’s Organic about Organic – The back road to real answers about organic production; a documentary by Shelly Rogers. Get Real! – by Mara Rockliff A fun and fast-paced book aimed at the teenage crowd (but likely to fascinate people of all ages) which addresses the problems of our consumerist society. Rockliff writes about factory farming, electronics, advertising, and other consumer issues in a way that is engaging and easy-to-understand. The book serves to illuminate how we can and do (knowingly or not) vote with our wallets. The Omnivore's Dilemma for Kids: The Secrets Behind What You Eat – “What’s for dinner?” seemed like a simple question, until journalist and supermarket detective Michael Pollan delved behind the scenes. From fast food and big organic to small farms and old-fashioned hunting and gathering, this young readers’ adaptation of Pollan’s famous food-chain exploration encourages kids to consider the personal and global health implications of their food choices. In a smart, compelling format with updated facts, plenty of photos, graphs, and visuals, as well as a new afterword, “The Omnivore’s Dilemma” serves up a bold message to the generation that needs it most: It’s time to take charge of our national eating habits – and it starts with you! Fanny at Chez Panisse: A Child's Restaurant Adventures with 46 Recipes – Chez Panisse, a restaurant in Berkeley, is the brainchild of renowned chef Alice Waters. Fanny is Alice Waters’ daughter and Fanny at Chez Panisse is a collection of 46 recipes that are simple, delicious, and fun to make. The first third of the book tells the story of Fanny's adventures at Chez Panisse and introduces many of the people who work and dine there. There is Bumps, a family friend who lives on a boat and makes special bread; Carrie, the florist who supplies Chez Panisse with its bouquets; and Jean, a customer who prefers to eat in the kitchen rather than the restaurant because “That's where the food and my favorite people are.” Through Fanny's eyes, the reader glimpses the inner workings of a quirky, wonderful restaurant and the people who run it. Schoolhouse Rock! Earth – Schoolhouse Rock goes green! Schoolhouse Rock! Earth has all the heart and musical soul of the original Schoolhouse Rock, designed for a new generation of fans! Eleven songs with new animation prove that caring about the environment can be rockin’ fun! The original Schoolhouse Rock masters have written all new songs sung by beloved voices from timeless classics like I'm Just A Bill and Conjunction Junction. There couldn't be a better time to be educated and entertained about water conservation, recycling, biodiversity, solar power and the rainforest, the Schoolhouse Rock way! TheMeatrix.com – A fun and informative online spoof that brings to light so many of the issues involved in the meat industry worldwide.